Plane crash survivors stranded on a deserted island uncover a military experiment that mutates humans into bloodthirsty savages. Archer Island – Pacific Northwest – “Above Top Secret” Military No-Fly Zone – Lt. John Paxton is forced to kill his own men when an experimental chemical weapon known as N-REX turns soldiers into bloodthirsty savages. At Base Command for the 77th Elite Sustainment Unit, project leader Colonel Magnuson ignores Paxton’s distress calls and orders Paxton’s execution. Pacific Northwest – Present Day – Carla Frye of Wilderness Adventures hosts an excursion for newlyweds Theresa and AJ, Troy Gregor, Christopher Chen, Oscar Truman, recovering junkie Clive Darrow and his friend Tanya Fox, and Henry Lawrence. Lt. Paxton, who plans to return to Archer Island and confront Col. Magnuson, is forced to join Carla’s group after learning that his own privately chartered plane is unavailable. During the flight, Troy sees that Paxton is packing a handgun and a struggle ensues. Anderson the pilot is shot and the plane crash lands just offshore of Archer Island. The survivors find evidence of the military’s experiment and samples of the N-REX toxin at an abandoned camp in the forest. Paxton eventually reveals details about Magnuson’s scheme and Paxton’s own plan to expose the operation. As the survivors are exposed to the toxin, they succumb to the virus one by one and attack the others until only Paxton, Carla, and Troy are left alive. Magnuson arrives on the island by helicopter with a squad of soldiers. Troy attempts to bargain with the colonel as a distraction for Paxton and Carla, but Magnuson executes Troy. Troy’s body is exposed to the toxin. Magnuson captures Paxton and Carla and takes them off the island in his chopper. Magnuson reveals that Carla is the daughter of the man who invented the chemical weapon and that Paxton’s DNA is needed to engineer an antidote because he is immune to the toxin. Troy is revealed to have reanimated. He had been clinging to the outside of the helicopter since liftoff. Troy reaches inside the cabin and pulls Magnuson to his death. However, a bag of the toxin hits the helicopter blades and disperses over the city below. After the copter crashes, Paxton and Carla emerge from the wreckage as the city begins erupting in chaos. In the movies, is it even possible for the military to develop a chemical weapon or to conduct a test that doesn’t end up raising a mutated creature from the ocean or infecting humans with a zombie virus? While “Toxin” features enough conspicuous ADR to give it a patina of dubbed kaiju creature feature, this is a case of the latter, where a secret experiment gone wrong unleashes rabid soldiers on an unpopulated island. Unpopulated until a renegade army lieutenant crashes a tourist party’s wilderness excursion and crash-lands their chartered plane, that is. Even though an evil colonel stands to make big money on the infectious powder, there are still bags of the stuff haphazardly lying all over the forest floor for anyone to pick up. The plane crash survivors do exactly that, and soon begin morphing into “28 Days Later”-style maniacs. 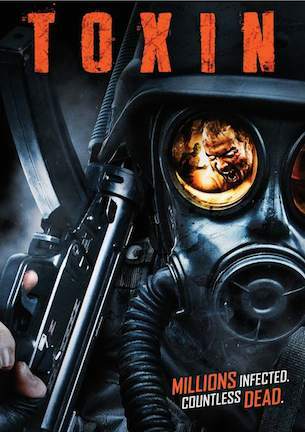 “Toxin” looks like the kind of low-budget quickie that was written, shot, and edited in about a week, maybe even just a single weekend. The content is so light that the movie only runs 69 minutes short without the credits. Real storylines do not even develop until the final ten minutes, when the script spontaneously piles on laughably clichéd revelations like the tour guide coincidentally being the daughter of the man who developed the toxin and the hero’s equally coincidental immunity to the virus being the key to creating an antidote. Until then, “Toxin” is an hour of generic stereotypes running from generic “creatures” that are merely screaming actors with blood smeared on their faces. This is one of those uninspired efforts where the personalities are defined by wardrobe instead of by authentic character development from the script. There’s the Ivy League yuppie wearing boat shoes without socks and a v-neck sweater tied around his shoulders. The chubby goof sports a backwards baseball cap and a Hawaiian shirt. And the phone-obsessed Asian is clad in khaki slacks and a button-down dress shirt. This is convenient for an audience looking to tell these people apart, but impractical as attire for a group embarking on a weekend-long wilderness adventure. The chiseled military man leading their charge doesn’t wear a shirt at all. Midway through the movie, a sprained ankle for the chubby goof provides an excuse for the hero to rip his tank top into a bandage. How that cures a sprained ankle, I don’t know. But it does give stuntman-turned-actor Doug Chapman ample opportunity to flaunt his physique for the next 15 minutes until he miraculously finds a replacement wife-beater. Chapman’s square-jawed alpha male, Lt. Paxton, is hard to appreciate as the movie’s good guy since he is the primary cause of every problem faced in the first place. The only way to make it to the private island where the outbreak occurs is by hijacking a private plane, which Paxton does even with a passenger cabin occupied by innocent civilians on vacation. Once they are stranded on the island, Paxton’s determination to remain mysterious means he consistently avoids offering any useful information or explanation about his terrorist-like behavior. This goes on to the point where one of the survivors repeatedly punches Paxton for the unnecessary frustration. The audience, meanwhile, has to be content with punching a couch pillow. Of course, had the hero behaved sensibly for one moment, there never would have been enough conflict to constitute a movie. Come to think of it, that might not have been such a bad course of action.